Its bonfire weekend in my village and I can not wait. This year we aren’t having friends and family over, instead we will be guests at a neighbours. I’m really looking forward to being the ‘visitor’ its my personal favourite, probably because I don’t have to rush the cleaning this weekend and then do it all over again when people leave. I love the procession, the anticipation and of course the fire works. We was also blessed with some pretty cute trick or treaters this week, so this townie chick may be embracing country life after all. Hayley my cohost picks a featured blogger each week, but stick around to see who I selected. She’s a regular on the blog, who usually if not always joins us before we’ve even tweeted. She is a passionate mummy with many skills and in this post I discovered her children also have the gift of being bilingual. Spectrum Mum (Catie) discusses how to approach raising a multi talking house and also warns against the pitfalls. I never really mastered a linguist tongue at school and now regret the opportunity to embrace new cultures, in my defence my french teacher was terrifying and I got a B through fear, but the gift of a voice beyond the mother tongue isn’t something I can offer my little dude and so if I’m honest I read this post with envy. Like everything when it comes to raising little people Catie talks about the delicate balance needed, communication of rules, research and how to not overwhelm them…parenting is tough. However, Spectrum Mums post is awesome if you are able or thinking of jumping into a multitude of languages. Its well worth a read, her guidance as always is invaluable. Many thanks if you are rejoining us, or if you simply enjoy the range of posts #thesatsesh community provide, please as always read the rules below and click the blue box (up to two posts from any genre, old or new are welcome). Grab a badge Please do add #thesatsesh badge. You can do this by copying and pasting the badge code into the text/HTML area of your post within your publishing platform and its located in my side bar for your ease. 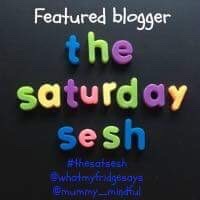 Tweet Share your posts on Twitter using the linky hashtag #thesatsesh and tag us in for retweets @fridgesays@mummy_mindful. Follow us if you don’t already please. Following the rules means you may qualify for our featured blogger announced weekly, plus this linky is run by school teachers so detention for anyone that doesn’t. OPTIONAL EXTRA: Come and play in our IG community by using #thesatsesh for photos of your weekend or perhaps connected to a post you’ve linked. Follow us on Instagram @fridgesays and @mission_mindfulness_blog and we will keep up to date and follow you back.